The Southern California HIMSS Chapter held their annual Charity Golf Tournament at Arroyo Trabuco Golf Club, Mission Viejo, CA on October 27th, 2017. The event was attended this year by 144 golfers who weathered a beautiful sunny day in California. Our evening dinner and cocktails was also joined by our SoCal HIMSS Board Members and network industry leaders. The tournament proved to a memorable event which included drawings, lunch, dinner, golf show, games, prizes, and our own PGA Tournament Golfers on the course with us. During the first two hours of the tournament we celebrated the Ronald McDonald House, Orange County as our charity of choice. Also joining us for the day was the founder of the original RMH in Orange, Fred Hill, alongside with his son. We were blessed to have them with us and local to our area. We all enjoyed our “Rocking Day” of golf. Pivotal to our planning committee was the RMH Orange County staff; who run the day-to-day operations: Noel Burcelis, Executive Director; Susan Kenny, Development Director; and Ruth Wu, Special Event Coordinator. SoCal HIMSS considers RMH-OC family to our organization. We took a collaborative approach while working with RMH. Our true hole-in-one was Jason Meyers, President and Founder, along with Matt Heath and Tyler Hummel, of 19th Hole Golf Productions, our partner company in the design and architecture of the entire day. Jason and team became our negotiators, our heavy-lifters – as we worked throughout the months of planning. Jason and team accommodated us with their own network of specialists in the industry ensuring we took no missteps in all our preparations. Jason kept his eye on the true reason for our Golf Event, to raise a substantial amount of charity funds to present to RMH, which will impact their home and the families they serve. By the end of the round, we were all good and tired; a spectacular day of reaching out to our fellow communities and healthcare providers. With a versatile group of golf skills, each player who joined us truly made the event enjoyable by all. After the round of golf, the attendees sat down to a fantastic dinner that entailed BBQ tri-tip, chicken, vegetables, French rolls and an assortment of baked bris and fruit, followed by coffee and dessert. Jason Meyers who emceed the event, thanked all those that supported the fundraiser and especially thanked those companies who had sponsored holes. The chapter had its highest support in years with 40+ sponsors, leading the group our title sponsors: Sirius Healthcare, Computer Solutions and Sunesys. In addition, Jason helped pull raffle tickets for the many raffle prizes won by the attendees. The event could not have taken place without the continued support of the many companies that attend each year, the SoCal HIMSS Golf Committee lead by Geri Pavia, SoCal HIMSS VP of Programs; and the amazing help of Ian Slade our SoCal HIMSS Chapter President, Ernesto Santana, Krystal Di Stephano, Cynthia Campos, Joanne Underwood, and our own Robin Wotipka, a true lifeline with all the details and last minute round-up of our all our volunteers. Thank you, team, for an amazing day! You all were so important to making this day a wonderful memory in our Chapter. 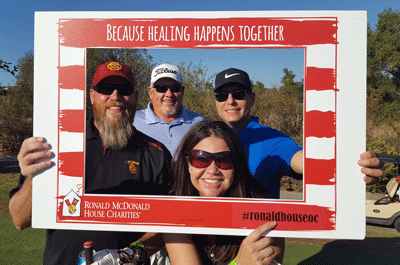 This year’s golf event raised a considerable amount of funds to be presented mid-December to the Ronald McDonald House of Orange, CA.